Next week I’m planning to fulfil a long-held ambition to walk a section of the pilgrimage route known as the Camino de Santiago de Compostela. 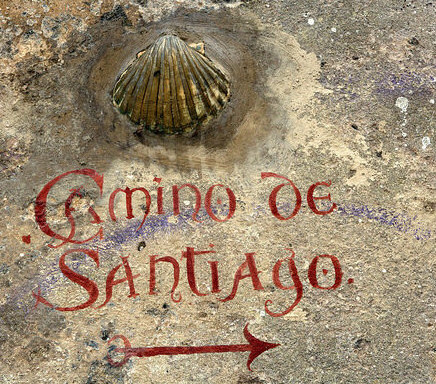 In its heyday, the Camino was one of the great pilgrimage routes of the western world, with the Spanish city of Santiago joining Rome and Jerusalem as one of the three holy destinations for good medieval Catholics. Santiago acquired its special status after the apostle St James reportedly travelled to northwestern Spain to found the new church there, miraculously re-appearing centuries later to help save the country from invading Muslims, In the process, he won himself the title of ‘Santiago Matamoros’ – St James the Moorslayer – and the Cathedral of Santiago became his reputed burial place. No one knows how a Galilean fisherman might have got to Spain, and no evidence of his remains were found there: probably the Spanish wanted a bit of early-church action on their soil, much like the English when they claimed that Jesus’ feet had trodden its green fields on the way to Glastonbury. Of course, as a 21st-century pluralist, I’m not embarking on the Camino in the spirit of a traditional Catholic, much less one endorsing a Christian jihad. Instead, I’m taking part in the modern revival of the Camino that speaks to the rise of a more experiential spiritual sensibility, akin to the one chronicled in The Secret Life of God. The numbers walking the Camino have risen dramatically over the past couple of decades, from a couple of thousand in the 1980s to almost 280 000 in 2016. Modern pilgrims walk for a variety of reasons: surveys attest to a whole gamut, from a need for exercise to the desire for a personal challenge. Yet when broken down so starkly, the reasons seem not to capture the spirit in which people embark on the Camino. Comments by pilgrims in the growing Camino literature and fora suggest that the motivations are broadly psycho-spiritual, and centre on the resolution of a problem or the search for healing. It seems clear that even in its modern form, there is something special about a pilgrimage, a journey to a particular destination with no practical purpose, which costs the undertaker considerable effort but often brings an intangible benefit. I suspect that the enduring appeal of pilgrimage has to do with the human need for movement; the fact that we are, as Bruce Chatwin wrote in The Songlines, ‘a migratory species’ which has the experience of walking long and far mapped deep into its DNA. It was probably this impulse that Chaucer was referring to when he described the longing of ‘folk’ to ‘goon on pilgrimages’ that overcame the English in spring, an atavistic longing that pre-dates the traditional Catholic pilgrimage and is now evolving beyond the social and religious framework that gave it form in the Middle Ages. My own pilgrimage will be modest. I’ve chosen to do the Camino Ingles, one of the lesser-known routes which, at about 120 km, has the advantage of meeting the minimum requirement of walking the last 100 km into Santiago to qualify for a compostela all by itself. 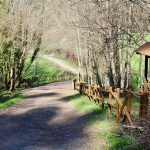 It’s also reportedly much quieter than the last stretch of the popular Camino Frances, which has become busy with coach parties and tourists in recent years. I like the fact that the Camino Ingles is the route that English pilgrims would have taken until the break from the Catholic Church put an end to pilgrimage as a socially acceptable activity. In times gone by, the ‘seafaring pilgrims from northern Europe’ would have sailed to Galicia’s northern coast before walking to the tomb of St James. So over the next week or so, don’t wish me luck, wish me Buen Camino.